In this solution guide, we will discuss the use of Mutable Infrastructures vs Immutable Infrastructures. We will also show you how to implement an image pipeline for an Immutable Infrastructure and provide an example of what tools are needed. This is a detailed, step by step, guide on how to build an Immutable Infrastructure pipeline on environments ranging in size from a DevOps Workstation to Production Deployment. Previously, we had to manually provision all of our servers. We would log into each server, run commands, install software, and copy code. Once the server was successfully provisioned, we would follow all of the same manual processes on every server. As the number of servers grew, sysadmins started writing scripts to automate these tasks. As technology evolved, we started using configuration management tools for managing all of the infrastructure changes. 1: Mutable Infrastructure: With a Mutable Infrastructure, software is installed and updated after the instance is launched. First, we launch the base image. Then we install and configure the required software packages and deploy our code. Once the new image gets added to the auto scaling group, additional changes will be applied to the group of servers. To maintain our configuration and push new changes to the servers, we typically use management tools like Chef, Ansible, or Puppet. 2: Immutable Infrastructure: Immutable Infrastructure is a more modern DevOps technique. It follows a process where any new images being deployed or configuration changes require a new image. This image will be baked with the new changes before the new servers are launched. This image is called a golden image or pre-bake image. Once the new instance, created from the updated image is added to the auto scaling group, it will be a functional server and ready to serve the users requests. 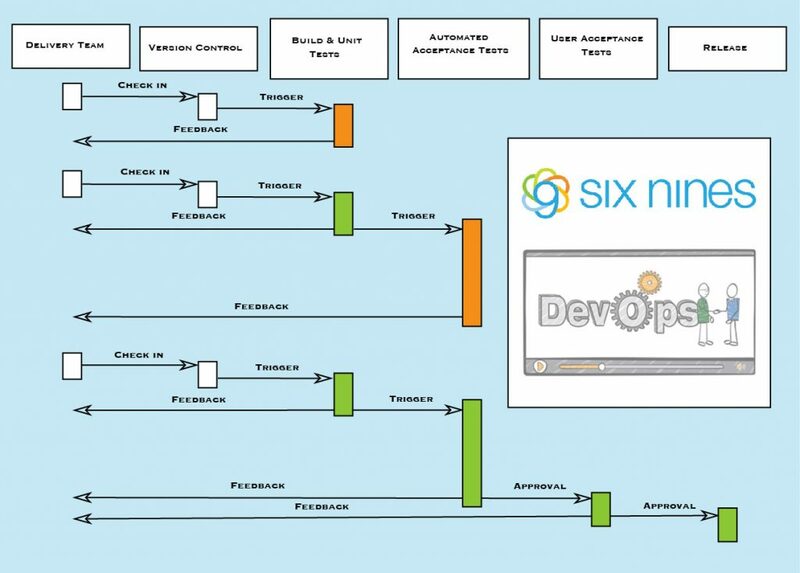 Both processes are fully automated and we can use the same configuration building, management, and deployment tools. The main differences between both of these processes are the deployment pipeline that is used and how we push updates to the production environment. Immutable Infrastructure was adopted from docker containers. When we deploy Docker containers, we create immutable docker images. The idea of using a docker container is to speed up the deployment process. Docker containers can be booted with lightning speed, but if the configuration and code deployment takes time, this can be a drawback for using containers. With Immutable Infrastructure, we build the virtual machine or container image once, use it on one or more servers, and never once log in to those servers to make changes. With Immutable Infrastructure, only tested and functional images are deployed. If any infrastructure changes are necessary, they are applied to the base image rather than to running systems. Therefore, you do not need to enable SSH and manually modify the server. This increases security and lowers the chance of human error. Vagrant: Vagrant is a tool for building complete development environments. Vagrant can be used to create and configure lightweight, reproducible, and portable development environments. It used for testing your cookbooks locally before pushing to code-commit. Chef or Ansible: You can use either Chef or Ansible as your configuration management tool for installing and configuring software on your server. In our case, we will be using Chef cookbooks. Ec2 : AWS service where your application code will deployed. Autoscaling: AWS service where a new launch configuration will be created for every build. Later, you will add your new instances to your autoscaling group. EC2 System Manager: EC2 Systems Manager helps to automate tasks, such as, creating images and creating launch configurations. 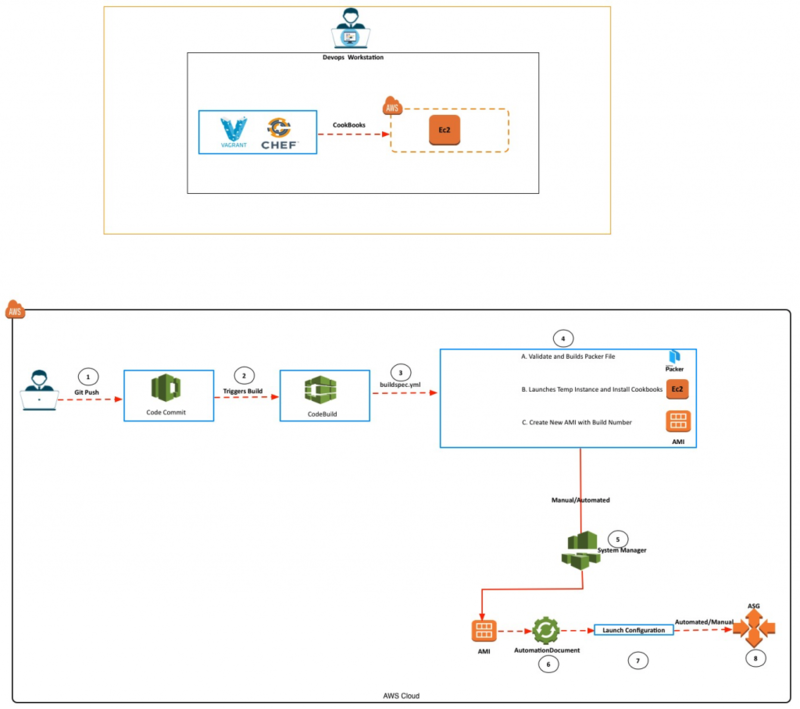 We use EC2 System Manager built workflows to accomplish complex tasks. Code-Commit: This is Amazon’s version of github. It is a managed source control as service. CodeBuild: This is Amazon’s alternative to Jenkins. It compiles cookbooks and runs tests against cookbooks. For this guide, we will be deploying a sample PHP application using two different cookbooks. The first is a LAMP cookbook, which installs and configures Linux, Apache, MySQL, and PHP. The second cookbook is called “aws-cloudwatch logs” and it installs and configures the cloudwatch log agent. For local testing, we will be using AWS as the provider for vagrant. Let’s start with setting up a DevOps Workstation. Once we are done testing our cookbooks locally now it’s time to push this cookbook to code-commit. This will launch a docker container to run our build. Whenever a user commits new changes, a cloud watch event will notify codebuild to trigger the new build. Once we have the AMI ID, we can call the AWS System Manager automation document through buildspec.yml or manually. You can run the automation document from the console, however, I would suggest using the manual process. Whenever a developer wants to test their code, they will pick the AMI ID and update the automation document parameters. Next, the automation document will create a new launch configuration and add to the specified auto scaling group. This model is very similar to the Continuous Delivery process. In the Continuous Delivery process, every change is not deployed immediately but every change can be deployable at any time.